The Charlotte Knights helped 25 former guests have a brighter holiday. 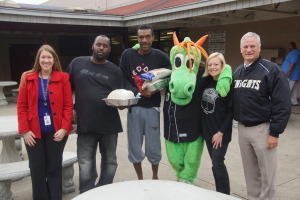 On Tuesday, Knights staff delivered frozen turkeys and stuffing to the shelter – but it didn’t stay there for long. The Thanksgiving meals went to former clients who now live on their own. “It means everything. Thanksgiving is about family,” said recipient Mike Wilson. Wilson moved into his own apartment about 6 months ago and was thankful to get a call from his case manager about the turkeys. The donation was a great opportunity for us to follow-up with the clients who have moved out and celebrate their successes over the last year. From July 1, 2013-June 30, 2014, 497 men moved into more appropriate housing. Homer’s Turkey Drive also delivered turkeys to First Baptist Church, Urban Ministries and Hospitality House of Charlotte. 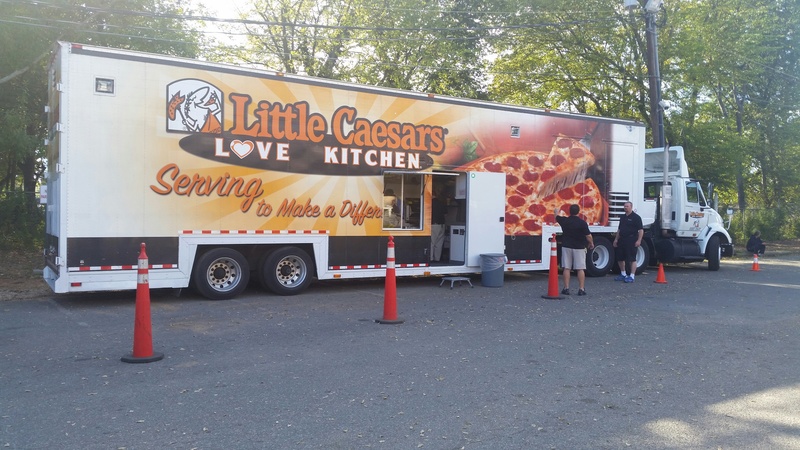 The Little Caesars Love Kitchen rolled into the Charlotte Men’s Shelter on Monday, October 20 to serve hot and ready pizzas to more than 350 men. The large rig travels across the county to feed the hungry, homeless and disaster survivors. 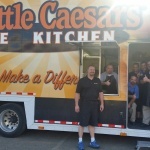 Volunteers from local franchises helped make 120 pizzas in a few hours. All of the supplies and labor came from local restaurants. 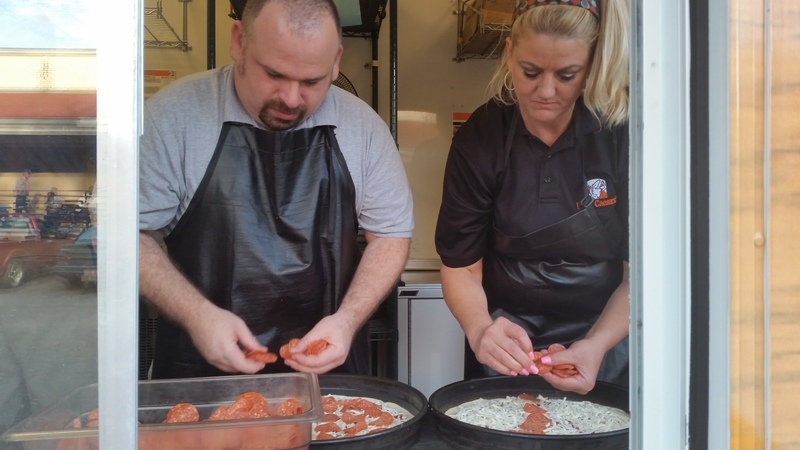 About half the pizzas were served to men at the North Tryon campus, where the traveling kitchen made its stop. 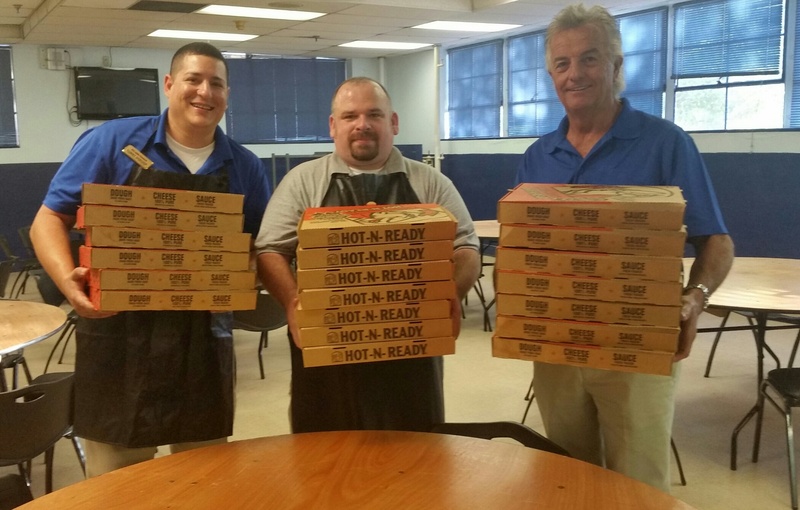 The remaining pizzas were delivered and served to clients at the Statesville Avenue campus, about two miles away. 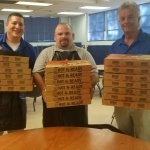 The Men’s Shelter of Charlotte is seeking additional restaurants to help prepare meals for the men at the shelter. If you would like to help, please contact Jennifer Coates, Community Resource Coordinator at Jennifer.Coates@MensShelterofCharlotte.org. 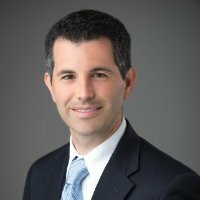 Congratulations to Jordan Abshire on winning the Charlotte Chamber Young Professionals Newcomer award for professional and civic engagement! 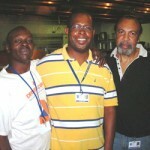 Abshire is a dedicated volunteer at Men’s Shelter of Charlotte. He was instrumental in helping to create the Housing & Employment Resource Center (HERC) where volunteers like Abshire work each week with men to overcome barriers to finding employment and maintaining housing. In addition, Abshire actively recruits new HERC volunteers and has helped develop volunteer training manuals. 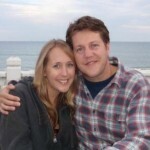 Meet Jason and Hayley Yepko-monthly donors to the Men’s Shelter of Charlotte. MSC provided 206,273 nights of shelter in FY2011-12 which represents a 14% increase in men served during the same time period last year. Meeting our community’s need has come at a cost and we need the financial support of individuals, like Jason and Hayley, to continue our work to serve as the catalyst for systemic change to end homelessness in our community. Hilton Whitaker was and still is a contender. After a 17-year boxing career, he is a boxing judge who travels the world to judge professional fights. Born in Brooklyn, NY, Whitaker grew up amidst gang violence. The 68-year-old says that while he definitely learned how to fight, he wanted more out of life. He served in the Army from 1960-1963 and joined the US National Boxing Team afterwards. In 1966, he was crowned “New Jersey State Champion” after winning the title fight. After retiring from professional fighting in 1972, he worked for New Jersey Transit as a bus driver for 30 years. When his wife passed away in 2009, Whitaker moved to Charlotte to be closer to his daughter and grandchildren.